(Bloomberg – bloomberg.com – Ekaterina Shatalova and Nicholas Brautlecht – October 15, 2013) Vladimir Putin is inching closer to his goal of turning Russia into a major transit route for trade between eastern Asia and Europe by prying open North Korea, a nuclear-capable dictatorship isolated for half a century. Russia last month completed the first land link that North Korea’s Stalinist regime has allowed to the outside world since 2003. Running between Khasan in Russia’s southeastern corner and North Korea’s rebuilt port of Rajin, the 54-kilometer rail link is part of a project President Putin is pushing that would reunite the railway systems of the two Koreas and tie them to the Trans-Siberian Railway. That would give Putin partial control over links to European train networks 8,000 kilometers (5,000 miles) away. The route is as much as three times faster than shipping via Egypt’s Suez Canal, which handles 17,000 ships a year, accounts for about 8 percent of maritime trade — and is increasingly beset by pirates and political instability in Egypt and Syria. OAO Mechel (MTLR), Russia’s biggest supplier of steel-making coal, will be among the customers in the first stage of the North Korea project, sending shipments eastward to Asian consumers, according to Moscow-based Russian Railways. The Rajin facility also can be refitted to move Asian goods westward to Europe. Mechel’s press service in Moscow declined to comment. Shipments to and from western Europe and Rajin will be delivered in just 14 days, compared with 45 days by ship, OAO Russian Railways Chief Executive Officer Vladimir Yakunin told reporters in North Korea Sept. 22. Getting the two Koreas to work together on the railway and a long-stalled plan to build a pipeline to supply both Koreas with Russian natural gas is fraught with financial and political hurdles, said Fyodor Lukyanov, head of the Council on Foreign and Defense Policy research group in Moscow. 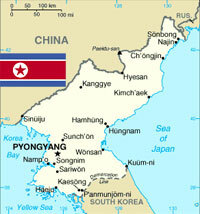 They stem from North Korea’s nuclear weapons program and lingering animosity from the 1950-1953 Korean War. “Russia’s position is to get North Korea involved in profitable projects to make them realize that cooperation is better than isolation,” Lukyanov said by phone from the Russian capital. North Korea is under United Nations sanctions for its atomic program. Six-nation talks that were designed to remove nuclear weapons from the peninsula were abandoned in 2009, when it detonated another device. The Koreas are technically still at war, having ended their military conflict with an armistice rather than a formal peace treaty. In 2003, the two countries opened a highway through their demilitarized zone, one of the most heavily armed borders in the world. None of that has stopped Russian Railways and its partners in the European Union and China from developing new links between the world’s two largest exporters, touting the routes as alternatives far removed from the political instability in Egypt and the wider Middle East. Far East Land Bridge, a Russian Railways venture, opened a new service between Suzhou in eastern China and Warsaw on Sept. 30. The first shipment, of “electronic and technology items,” will make the 7,600-kilometer journey in 14 days, linking with the Trans-Siberian via Mongolia and reaching Poland through Belarus, the Vienna-based company said in a statement Oct. 7. Russian Railways and its counterparts in China and Germany in August introduced a direct link between Hamburg and Zhengzhou in north-central China that takes as little as 15 days and travels through Kazakhstan, Russia, Belarus and Poland. “Our goal is a daily service,” Ruediger Grube, CEO of Deutsche Bahn AG, said after 51 shipping containers of goods from China arrived in Hamburg by train Aug. 2. The Russian and German rail operators opened an 11,000-kilometer service between Chongqing in southwest China and the German transport hub of Duisburg via Kazakhstan, Russia, Belarus and Poland in 2011. The travel time varies from 16 days to 23 days, according DB Schenker, Deutsche Bahn’s cargo unit. Major customers include Bayerische Motoren Werke AG, which ships auto parts west to factories in China, and Hewlett-Packard Co. (HP), which transports computers the other way. While the Chongqing line is focused on shipments between Europe and China, the Korean link caters to traffic between Europe and the rest of eastern Asia, Russian Railways said. China, Japan and South Korea together account for about a quarter of the global economy. Putin has urged South Korean President Park Geun Hye, who assumed office in February, to work with North Korea on relinking their rail networks, most recently last month at the Group of 20 summit in St. Petersburg. Park publicly affirmed her commitment to reunifying the Trans-Korean when she met with officials in Busan, South Korea’s largest port, in July. Putin plans to make his third state visit to Seoul for talks with Park in mid-November, Chosun Ilbo reported Oct. 1, without saying where it got the information. Dmitry Peskov, Putin’s spokesman, declined to comment on the report. North and South Korea resumed cross-border rail service in 2007 for the first time in 56 years amid a mood of detente, though North Korea closed it down after 18 months and hasn’t reopened it since.